Are you looking for a commercial contractor in Maple Grove? Call Titus Contracting! 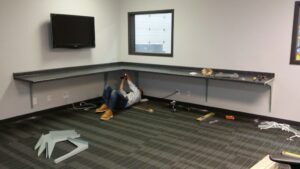 We are a full service commercial renovation and remodeling company, and we are ready to tackle the next office or commercial improvement project you need our help with. Just let us know what you are looking for, and we can make it happen. We are a trusted commercial contractor in this area, and we have helped countless business owners like you get the new commercial space that they want. What sets us apart from our competition? There are a few things. For one, we pay close attention to the details that other remodeling companies sometimes miss. For another, we design your new space with you. We use as many of your ideas as possible so you get the exact new space that you want. Call us so we can set up a time to come to your commercial space to hear more about what you want and need. After that, we will set up a schedule and begin work on your commercial renovations. Our commercial contractor can help with commercial spaces of all sizes. Whether you want a smaller dental office remodeled or a large warehouse renovated and made ADA compliant (or anything in between! ), our team here can help. We are fully licensed, bonded and insured, and we have plenty of happy and satisfied customers that we have worked with over the years. We are also sure to hire only the best for our team simply because we want to offer our clients nothing but the best when it comes to our remodeling services. Our commercial remodeling company is passionate about what we do. We are customer-driven and customer-focused, and we believe in building lifelong working relationships with everyone we do business with. We want you to continue to come to us when you need remodeling help, and we love word-of-mouth business too. Do you want more information on how to hire us as your commercial contractor in Maple Grove or the surrounding areas? Call Titus Contracting at 952-746-7817, or you can contact us to get a Free Estimate.